The homebrew package manager for mac is seriously awesome. Setting it up is a bit tricky if you don’t know what to do — and hopefully this post will help. Step 1: The first thing you need to do is to install Xcode. Go to the App store and search for Xcode. Install it. … except yours won’t be complete! 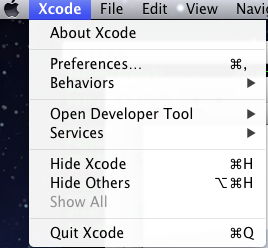 Step 3: Now open Xcode (the easiest way is to command-space and type in ‘Xcode’). 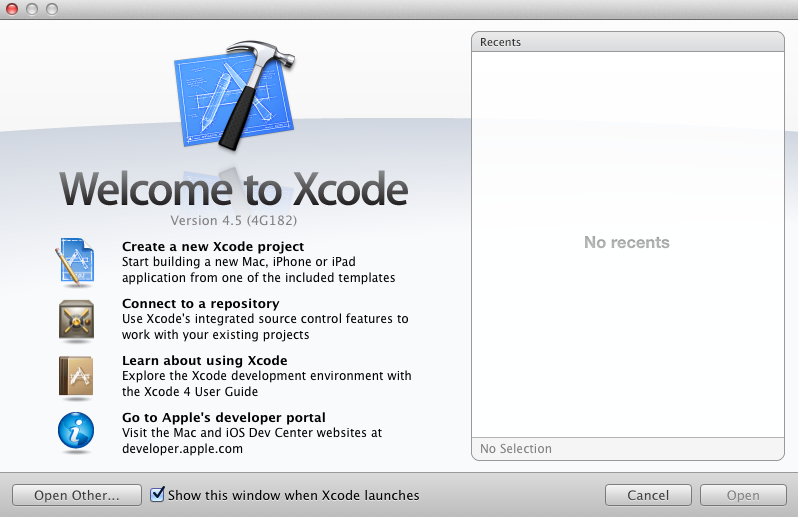 You will see the Xcode welcome screen. Step 4: Get an apple developer ID (if you do not have one). You can get it here, if you do not have one. You can sign in with your apple ID you have associated with your app-store and iTunes accounts. Step 5: Go to Xcode preferences. Step 6: Click on the ‘Downloads’ tab, and in the ‘Components’ section, select install for the Command Line Tools (wait again). If you see that, you’re ready for step 8! Step 8: Get the brewer-kit. $ ruby -e "$(curl -fsSL https://raw.github.com/Homebrew/homebrew/go/install)"
You need only enter your ‘sudo’ Password and it will complete. occurs before /usr/bin in your PATH. Warning: Some directories in /usr/local/share/man aren’t writable. directories, then the install will fail during the link step. Your system is raring to brew. This entry was posted in tech and tagged homebrew, Xcode. Bookmark the permalink. It is a good tool. It took me weeks to figure it out the first time. Wish i had my tutorial handy … Which is pretty much why i wrote it. Also, please ask wherever you got this link from to update it to the above. It works! I wanted to install gnuplot on my mac. And apparently, the easiest way to do so is to install install “homebrew” first, and then type the command “brew install gnuplot”. Thank you for the tutorial!!! Hurrah! In the end I got a website from where I can genuinely get helpful data regarding my study and knowledge. Warning: Setting DYLD_* vars can break dynamic linking. Btw get yourself a github account, if you don’t have one. The help from the associated lists is excellent. This is my first time visit att here and i am actually pleasant to rewad all at single place. Homebrew (package manager) installation on mac. thanks, i made the update. please let me know if you find any more bugs. it’s been a few months since i did an install. Hi there! I’ve been trying hard to install Homebrew but for the last 24 hours I’ve been facing some password issues. I can’t work out what is the sudo password. I even had to reset my the root user on my mac, but I can’t move on. the cursor at the password prompt doesn’t even blimp. So I’m not sure what to do to be able to install Homebrew. Can someone out there help me? The sudo password is probably whatever your login password is. The cursor in terminal should not flash, this is normal. Thanks. I worked it out! What if there isn’t a “command line tools” under components? If I no longer need homebrew, is there anything i can do to undo the permissions changes in step 8? what’s the deal with all the permissions being reset from root to user? I am not comfortable with this! Any explanation?